Some of Birmingham’s biggest names in sport, business and politics have been helping Birmingham Friends of the Earth to promote a reduction in car use. (Full story on their website here http://www.avfc.co.uk/page/NewsDetail/0,,10265~2161294,00.html) is encouraging supporters to find alternative means of transport. With a match on the day, the club knows that getting supporters to the game in the most efficient way benefits everyone. 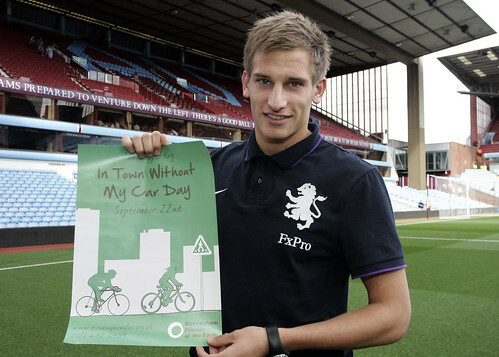 Villa staff will be supporting ‘In Town Without My Car’ day more fully on Friday, as part of their regular transport day activities. Staff who choose a sustainable means of transport on the day (walk, cycle, public transport, car share) will be entered into a raffle to win a prize. Panna Amliwala, who helped co-ordinate the event for Birmingham Friends of the Earth, said: “Choosing sustainable travel is an important hot button topic and we encourage more organisations to help employees and customers with the options they have, as Aston Villa have done. Jerry Blackett of Birmingham Chamber of Commerce has long been a champion of sustainable transport and his organisation offered free buns and coffee to car-free employees on the day, which went down very well as can be seen here. Several cabinet members from Birmingham City Council also pledged to travel by other means than car for In Town Without My Car Day, although on this particular day, sustainability champion Cllr Tilsley was not able to do without a car, so used an electric car to get around. Birmingham Friends of the Earth transport campaigner Martin Stride commented: “It is disappointing that leading councillors still feel they are unable to get around on public transport well enough in order to perform their jobs. This clearly shows that we have a long way to go before public transport provision in the second city is up to scratch. On the day, green campaigners were out giving medals to people who left their cars at home and free bus passes supplied by National Express West Midlands as they turned a car parking space into a green park.